I want to store the 2 excel column data in two variable. then I need to compare the values are matching or not, if it matches then action will perform. I am doing edit operation in my automation script.. 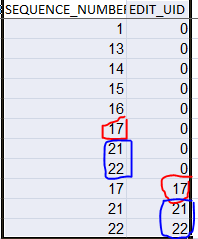 Here 2 columns are there , firstly i need to store the data in 2 variable and then compare, here 17 is one event and 21 and 22 is one event…. how to store the values and compare ? I put Record Object in haspmap, so then I need to store and add the data..how ?